Ernst, sadly is far from alone in her hostility to environmental common sense. We hear similarly overheated remarks from her GOP colleagues, Majority Leader Mitch McConnell, and even a handful of Democrats. Yikes! That’s why I’m traveling to Washington on March 26 to set the record straight and demand that Senator Ernst, and all Senators, stand up and do the right thing for our planet and for their constituents: vote for the Green New Deal. Let’s all calm down. First of all, the GND is a non-binding resolution. It is a set of goals and policy guidelines. It is an outline of the many ways to fight climate change. It is a compilation of best practices that we can further refine and draw on to build into smart, effective policy. It is 14 pages long. Don’t let the hyperbolic reactions of a few ideologues drown out this basic set of practical concepts. The GND addresses the actual huge problem we all face: climate change. If Senator Ernst and the many other naysayers feel a need to express frenzied concern, they should focus on the real perils of the 12-year window to combat climate change: that’s all the time we have to create a livable future for us all. Cooler heads see that The Green New Deal is an idea whose time has come. The need for clean energy and the urgency to severely limit carbon emissions is an overwhelming scientific truth. The need for the “Green” half of the GND resolution is based on indisputable facts. The “New Deal” half of the GND has historical roots which resonate deeply within the living memory of many Americans. The original New Deal, as implemented by Franklin Delano Roosevelt helped to stimulate our economy. FDR’s grand vision offered the dignity of meaningful work, and it helped to pull our country out of the Great Depression. It gave our people hope for a better future. It improved the lives of millions of Americans, like my grandfather, who lost his farm in the dust bowl days in Oklahoma. It offered my mother’s family a hand up, not a handout. It gave their struggling family hope for a better future for three children. These kids went on to be productive citizens, who lived to see their children achieve college degrees and solid middle-class lives. That’s not just the story of my family. It’s the story of generations of families lifted up by the New Deal. The Green New Deal is a 21st century iteration of that brilliant and humane policy, and the American promise. The ideas that form the heart of the Green New Deal – retrofitting our schools and public buildings for energy efficiency, installing solar systems for millions of homes and businesses, incentivizing clean energy production and transportation, and promoting sustainable agricultural practices – will not only help our planet survive, they will clean up our air and water. At the same time, the Green New Deal will create good quality, non-exportable jobs in every community in our country. Our infrastructure will be improved and updated, and our economy will be hugely stimulated while we mitigate the worst consequences of climate change. To me, that sounds like a win-win-win! So the Green New Deal is not, as Senator Ernst has claimed, “radical.” It has deep historical roots. It will not “destroy jobs,” on the contrary: It will create many thousands of vitally needed infrastructure and energy-saving jobs. The Green New Deal will not “hinder our strong ag industry”. It will help return our farming to sustainable practices and viable family farming opportunities. The Green New Deal is emblematic of the American “can do” spirit, and willingness meet our challenges head-on. We lifted our suffering people out of the Great Depression. We rapidly geared up for World War II. We efficiently developed our vast interstate highway system. We quickly created a space program, and put a man on the moon. We even cleaned up our nation’s roadside litter problem with the help of a national public school initiative. Millions of kids learned about civic pride, nagged their parents for car litter bags, and called out litter bugs. I was one of those kids! I felt proud of my part in cleaning up America’s roadsides. When is the last time we had a nationwide initiative that made us feel proud? It’s high time we worked together to address our most pressing problems. America has always benefitted from our spirit of innovation, technical expertise, our energy, optimism, and hard work. The Green New Deal will tap these qualities to tackle climate change. I do not consider these American values a “far-left fantasy,” as my Senator has labeled them. What we need is inspired leaders who are willing to accept the hard truths of our age and commit to tackle them, rather than raise reactionary cries to stop progress. Our leadership must educate and mobilize the country to overcome this huge challenge. They, and we, must listen to the young folks. They are fighting for their right to live on our precious and amazing planet. The Green New Deal lifts us from denial or resignation to action and determination. It is an affirmation of love and concern for our children and all living things on Earth. 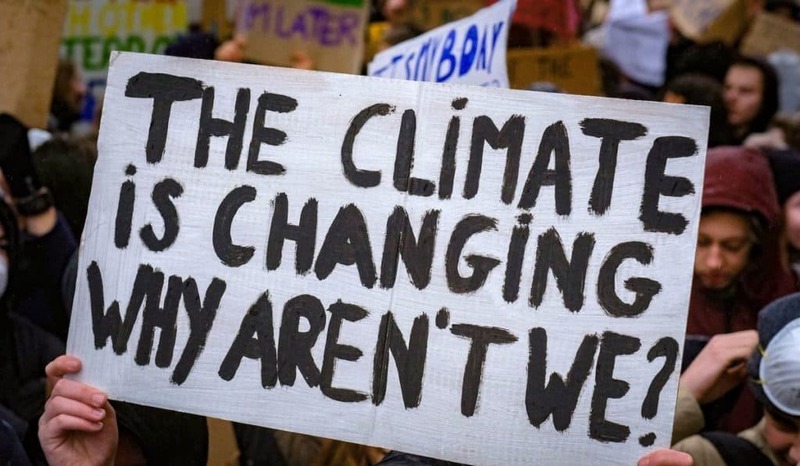 Fight for our future with individual actions, collective participation in any of the many groups and organizations working for climate justice, and help elect tough and wise leadership to guide us.